With the holidays just around the corner, many of us get to celebrate and relax by spending time with our families. Many industries shut down for the day on Thanksgiving and Christmas to give employees some much-needed time off. People don't usually think about where goods have come from and how it got there. If you can buy it, eat it, or use it, it's been delivered by truck to the store or company you bought it from. Really, anything anyone has ever bought, used, eaten, or worn, has been on a truck. We wouldn't have anything if it wasn’t for truckers. Truckers have a knack for knowing how to survive on the road. Even better though, truckers often use their abilities selflessly. We call them "Highway Angels." They can be seen performing random acts of kindness by helping fellow motorists out in times of need. Whether it's helping change a spare tire, or actually helping save the lives of others, truckers often put others before themselves. Truckers help us to enjoy spending time with our family and friends by doing the jobs we can’t. Trucking isn’t for everybody; and to have goods we need in a timely manner, truckers have to make sacrifices that others do not. When others stop working, they keep rolling to make sure others can have the goods they need to enjoy time with their friends and family. So as the holiday season rolls around, make sure to think about those that make the sacrifices others don’t. Truckers are oftentimes underappreciated workers, but they’re what makes America go. 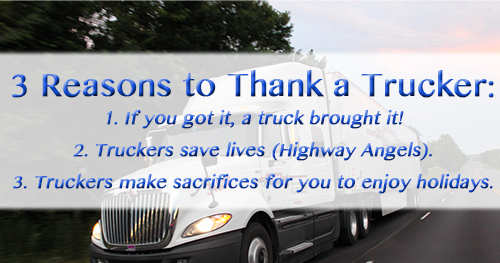 If you get the chance to do so, make sure to thank a trucker for what they do.